I finally finished the quilting and binding on my Project Pure challenge quilt. I don't normally machine quilt, but I thought this was a good way to practice since it was a smaller quilt. I had to do straight lines because my antique machine doesn't have the ability to lower the feed dogs (these are the little teeth that pull material past the needle). I replicated the vertical pattern horizontally in the quilting (thanks for the idea Cindy!). 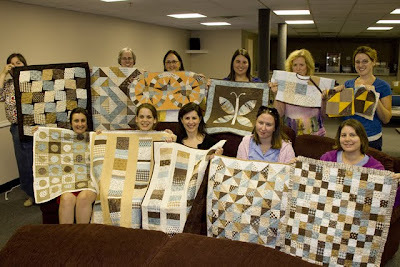 We had a meeting of the Philadelphia Modern Quilt Guild this week where everyone was able to show off their creations using the Pure fabric. 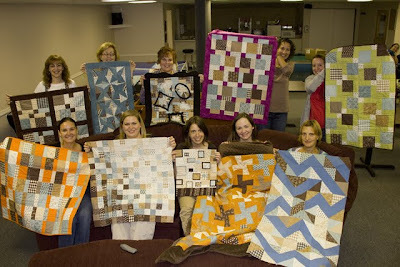 It is amazing what different quilts result from the same fabric. Such a pretty quilt! I can't wait to try one for myself one of these days :) Thanks for taking me with you!